A portion of the Wright Tablet is shown. It was found in Montgomery County, Kentucky and it appears so dramatically different from the other three tablets previously studied that they seem unrelated. Hence, other authors have described them as different in style and content. In due course we shall see that the difference is a result of artistic choice and the message is the same. 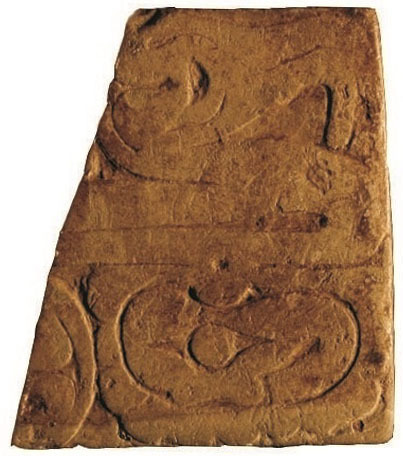 This tablet when viewed on its side as shown, looks deceptively like a bird with a vertical eye, beak, neck, and body. It also seems to be positioned above its nest. The deception is probably intentional to mislead the uninitiated. The initiate would see that the egg in the nest looks remarkably like an eye. The eye is surrounded by something that has a tail. In fact a comet also has an eye, is surrounded by matter and has a tail. The bird head has a similar feature and the beak forms two tails. Indeed, this vertical eye looks remarkably like the Luwian Hieroglyph Caelum, symbol # 182, which means heaven. It has no associated sound. A comet can be described as a bird from heaven. The first impression is that this tablet is devoid of numbers in contrast to the Kiefer Tablet. However, the ‘sa’ circle provides us with 1, the bar’s black hollow area is 1, and the two sides of the bar creates 2 or 112 appears once again. The bird’s head also provides 112. The area to the left of the vertical eye is shaped to create a dot, the eye forms 1 and the tail forms 2. The nest area also provides 112. The eye is 1, the tail is 1 and there are two lobes on the loop surrounding the eye. There appears to be twelve lobes on the exterior of the nest but the right edge is too worn to confirm this. If it is 12 then the ‘sa’ provides 1 and the 12 completes the number to create 112. Counting dots and circles across the image gives 1,1,1. Including the bird eye in the count gives 1,1,2. Recall 112 is 2 x 56. This bird head symbol is identifiable in the Meigs County Tablet and Lakin B Tablet. 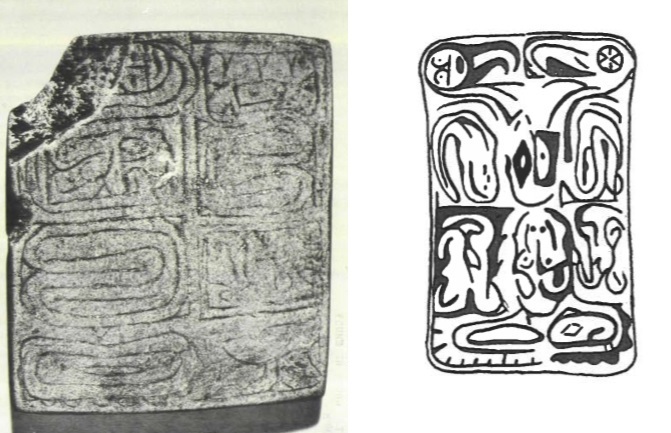 The Lakin B Tablet is a photo from Ohio Archaeologist and the image on the right is from David Penny’s report. The location of both tablets is unknown. Both tablets consist of an eight panel layout except the Meigs squeezes in the double central image which will be dominant in the Cincinnati Tablet (future post). However, the artist preserved the 2 x 4 layout. The number 2,4,8 is apparent here and what is 248 but a reminder of the circumference of the planet at 24868 miles. Taking this one step further, by squeezing in the two extra panels the Meigs records the series 2,4,8,6 which makes the comparison stronger. Or it can be said it records 8,6,4,2 as was noted in the Grave Creek Tablet and it relates to the diameter of the Sun at 864,336 miles. There is no suggestion here that the artist or society was able to measure the planet or the Sun just that they were taught the numbers and their importance in the very same way the average person is today. Lakin B on left and Meigs Tablet on right. What is apparent is that the Lakin B (from Mason County, West Virginia) appears to be instructional as if someone created the tablet to explain an event and we can almost hear s/he speaking to us. The Meigs (from Meigs County, Ohio) tablet upon close inspection seems to relate the same story but slightly more stylized and with hash marks in the bottom left indicating numbers were inherent to the story. If the image is accurate the number 792 is easily counted out. Counting the full set as 9 and then counting left to right to the largest mark is 7 leaving 2. The Kiefer Tablet noted 79-24 and which reminds one of the diameter of the planet. Examination of the bottom left of the Lakin B reveals scallops on the figure that appear to count out nine with two on one side of the figure and seven on the bottom which may also create 792. Or indeed, there is no reason to exclude the number 279 which also relates to astronomical measures. The distance to the asteroid belt which lies beyond Mars and encircles the four inner planets is 2.79 Astronomical Units (ie. 2.79 Earth to Sun distances). Taking this useful set of numbers one step further, they also make 29.7 which is the longest period in days between full Moons and is the diameter of the Earth in reverse. A good idea as to what story these tablets relate might be found by reviewing the easily read Metcalf Stone. Next we follow the bird head and it takes us to the Berlin tablet. This entry was posted in American History, Ancient History, History of English Language, Mysteries, Religion, Uncategorized and tagged Adena Indians, American Indian, Baal, Mound Builders Religion, The Wright Tablet.